Vodacom Now! : The NXT LVL Show: Where are they now? The NXT LVL Show was always about finding SA’s hottest young talent, musicians who were just waiting for the right help to vault their careers into the stratosphere. You came along for the journey, watching the artists be mentored by music legends Danny K, Big Nuz, DJ Zinhle, Euphonik and Riky Rick. We caught up with the finalists to see what they’re up to now. Zethembiso Perfect Mdletshe, aka Zethe, was mentored by Euphonik. She found the style she loved and crushed all the competition to win the whole show. Watch her winning performance here. She won a cool R1 million worth of prizes: a brand-new car worth R300 000, R100 000 in cash, studio sessions to the value of R600 000 to lay her new hit single, a music video worth R150 000, a PR and management deal of R225 000 and her own line of Rocka music accessories. So what’s she been up to? What are you doing currently? I am currently working on my EP, set to drop in March/April 2018. (YOU GUYS ARE NOT READY!) I recently launched my YouTube channel where I talk about a life of a musician and things around me. What have you been up to, in terms of pushing your music career since the Vodacom NXT LVL TV show ended? I've been performing at countless venues. I continued expanding my fan base. I’ve been focussing on my image, on songwriting and the other entertainment things I want to involve myself in, for example, modelling and brand influencing. What did you gain from being mentored? Self confidence and believing in my craft. How has the Vodacom NXT LVL TV show taken your music career to the NXT LVL? Lol weeeeeeeell … My five-year plan came true in one night! What advice do you have for SA youth to encourage them to get out there and realise their own dreams? Never be afraid to take chances in life. Doing what you love is probably the best things you can do for yourself. And don't forget to write everything down. Sum up the Vodacom NXT LVL experience in three words: Life changing experience! KZN-born Thamsanqa Vuyo Thobile Mathonsi, better known as Thami, stood out from the beginning. His mentor, Danny K, helped him build his self-confidence and Thami was a serious contender for the big prize. Watch Thami’s final performance here. What are you doing currently? I am currently studying at the University of Johannesburg. What have you been up to, in terms of pushing your music career since the Vodacom NXT LVL TV show ended? Well, since the show, I have been recording some music and I am currently working with Linda Gcwensa. I’m sending demos to different companies to get a good deal. What did you gain from being mentored? The biggest thing I gained was learning to stand for what I believe in. How has the Vodacom NXT LVL TV show taken your music career to the NXT LVL? I have made the most amazing musical relationships, and hope to build on them in the near future. Sum up the Vodacom NXT LVL experience in three words: Work, Sweat, AMAZING LOL! Cape Town student Jason Johnson, better known as Jesse Reignz, claimed the top spot on leaderboard more than once. 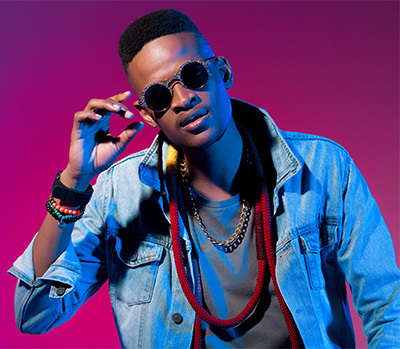 His mentor, Riky Rick, helped him win many fans. Watch his final performance here. What are you doing currently? I am currently completing the final semester of my undergraduate degree at UCT in order to graduate in July 2018. I am also happy that I am securing performances in Cape Town and Johannesburg, as well as beginning to work more closely with Vodacom in promoting NXT LVL as an ambassador. What did you gain from being mentored? My greatest gain from the mentorship programme has definitely been an increase in my level of confidence, on and off stage. I’m known to be very reserved, but the feedback I received on the show from each mentor has helped me to apply their knowledge which has increased my confidence and stage presence during my performances. How has the Vodacom NXT LVL TV show taken your music career to the NXT LVL? The show gave me a significant level of exposure which has led to an increased fan base, as well as access to opportunities I would not have been able to capitalise on without being associated with Vodacom. It also taught me a lot about the difficulties and realities of the music industry in terms of efficiently managing prospective business opportunities and contacts networks. What advice do you have for SA youth to encourage them to get out there and realize their own dreams? Whenever I engage with a stranger who recognises me from the show, I ask them for their name and what they would like to do with their talent or gifts, as this usually gives me the opportunity to let them know that they are capable of achieving anything they set their minds to. The biggest lesson I try to share with them is to be themselves and to persevere through trials, regardless of the number of setbacks they may encounter in realising their dreams. Theophilus Mohau Seretse is from Tshwane. He impressed with his dancing and skills behind the camera. The NXT LVL Show has blown the future wide open for this guy! Watch his final performance here. What are you doing currently? I am currently pushing my own music as an independent record producer and artist while completing my tertiary studies. What have you been up to, in terms of pushing your music career since the Vodacom NXT LVL TV show ended? I've done a couple of live performances in December 2017 and I am now currently finishing up my EP project - #B4thaMoney which will drop in March 2018. What did you gain from being mentored? I have gained knowledge that will help me push my brand to the limit in terms of my image and no being afraid to take risks. How has the Vodacom NXT LVL TV show taken your music career to the NXT LVL? Vodacom NXT LVL has given me great exposure - more people know of my existence, what I am able to do musically and now I'm balling data. THANK YOU VODACOM! What advice do you have for SA youth to encourage them to get out there and realize their own dreams? The only person who's standing between you and reaching your goal is yourself. Don't let yourself down by not pushing your limits. Sum up the Vodacom NXT LVL experience in three words: WAY TOO LIT! Music 97 lost out after a great competition. Their mentors, Big Nuz, had tons of faith in their awesome talent. So what is the group up to now? We asked Khanyi, their lead singer. What are you doing currently? Personally, I’m working, trying to make ends meet. As a band, though, we’re working on a few singles. We hope they’ll be out soon. What have you been up to, in terms of pushing your music career since the Vodacom NXT LVL TV show ended? We’re still marketing ourselves, volunteering to be an opening act for big stars who come to Mpumalanga. What did you gain from being mentored? Self confidence. Now I understand that second chances do exist, and you shouldn’t be afraid to take them. Basically, try, try and try again. How has the Vodacom NXT LVL TV show taken your music career to the NXT LVL? We now know more about the industry and are aware of some flips and tricks. We hope to make moves soon! Sum up the Vodacom NXT LVL experience in three words: Talent, Laughter, Fun. If you’re under 25 and want access to be best value data bundles and airtime, plus awesome extra benefits, join Vodacom NXT LVL. Find out how on the Vodacom website.